I am still walking on sunshine after Brooklyn Unite Live! rejuvenated all of the cells in my body. I feel like I am ten years younger and that I’m the love child of Tony Robbins and Beyoncé – I am beyond motivated and feel like I can conquer the world. If you want to permanently turn your life dial to 100% pure positivity you have to experience these 33 Brooklyn youngsters whose drum and dance corps originality will blow out all of the cobwebs growing on your bucket list. I wish they had this after-school program for adults so we could also connect to high-octane, exuberant, self-confidence that is off the Richter scale. I spent the entire show whooping, cheering, laughing, crying, clapping loudly with permanent gooseflesh from the amazing life-affirming moments. These children are super skilled, fearless, hugely talented and radiate joy in abundance. You can’t help but get swept up in their infectious enthusiasm. The show charts the ethos, vision and heart of Brooklyn United Music and Arts program which is “more than an after-school program”, it’s a way of life. The story of these incredible young people is told through live drumming and dancing as well as video inserts. In between the incredible drumming routines and epic dance numbers we get a real sense of the journey these children undertake through the documentary footage. We see the disciplined environment of “homework first”, preparation for competitions and shows as well as interviews with students, teachers and parents. These segments paint a full picture of an environment filled with nurturance, inspiration and community. I particularly enjoyed the insert by choreographer, Dara Adams, where she spoke passionately about being actively present in the positive transformation of the young girls into womanhood. A deeply moving piece was an homage to the “Black Lives Matter” movement told through dance and underscored by powerful visuals. It’s amazing to see the youth understanding the social and political landscape of their communities and using their art to promote a tolerant society that honors diversity. Another defining performance piece was born out of a recent trip to South Africa where they connected to the local community and re-connected with their African roots. They brought back the sounds, rhythms and dance styles of the African continent to stir our souls in NYC. Brooklyn United have also ‘adopted’ an under-resourced school in South Africa supplying them with teaching materials and other support. This cross continent sharing made my heart sing. Music and drum instructor’s Derek Allen, Rodney Smith Jr., Damien Walker exude high energy optimism that has clearly been transferred to the young men in their care. It is evident in every drum beat they execute and in the ecstatic fervor the young performers generate on stage and in the audience. These teachers are doing a sensational job! This beautiful, uplifting show is co-directed by Tyrone Brown, Renita Leonce, and Dan Safer and choreographed by Dara Adams and associate choreographer LaQuasia Crandell. You really want your children to be part of this exceptional ‘family’ where there is obvious respect and genuine care for the children aged 5 -17 in the program. You can see that they are growing our future leaders with a healthy dose of structure, creative expression, love and support. They have ensured these children have unique opportunities like performing for the Brooklyn Nets, on television in SHOWTIME AT THE APOLLO with host Steve Harvey, Celebrate Brooklyn, The Tonight Show with Jay Leno, Last Week Tonight with John Oliver, The Music of David Byrne & Talking Heads at Carnegie Hall and previously at La MaMa’s 2017 Gala and Block Party. 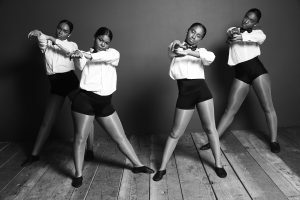 The brilliant dancer team comprised Alyssa Reaves, Destiny Cox, Essence John, Heaven Allah, Ja’Dell Mendoza, Jacera Alston, Ja’Naya Grant, Jaelyn Grant, Layana Lawrence, Layla Richardson, Mia Anderson, Niobi Ramirez, Ny’Asia E. Peterson, Shanice McBean, Sianna Skye Davis, Soleil Autumn Berry, Yasmeen Middleton. These young women pulsed with self confidence, commitment and focus. They were all majestic as well as being incredible role models for all young women everywhere. The outstanding drum corps members included snare players: Kayden Stennett, Makhi Crosland, Paris Leonce, Royal-Hyness Allah, tenor players: DeAndre McCray, Kayden Holder, Naaem Cook, qunit players:,Mekhi J Pringle, Kashawn Hawkins, bass players: Aari Weekes, David Rissell Jr, Gavin Blake, Prince Allah, Rashawn Hawkins and cymbal player: Aidyn Washington. It felt like they could change the world with their heartfelt drumming. Not only are they incredibly skilled but they radiate playfulness. You can see that they are having such fun on stage. The BU mission is to “strive to build strong, well-rounded, healthy, confident and capable young people,” and they are obviously fulfilling that vision. I left the theater feeling a palpable sense of possibility and joy which has stayed with me. I think Brooklyn United are the antidote for any passivity, negativity, depression or hopelessness one might feel at global events. They seem to have found the secret to eternal optimism. The life skills and performance techniques these young people are learning will change their lives and those around them for many years. They certainly changed me.